WordPress is one of the most popular blogging platforms currently available on the Internet. Popular sites like Techcrunch, Gizmodo or yours truly are all powered by WordPress. Users who are just getting started have a few options at their disposal. They can start with a blog over at WordPress.com, get their own website and self-host WordPress there, or start with a local version of the blogging software. WordPress Portable is a free program for Windows that automatically ships with everything needed to run WordPress locally. All you need to do is to extract the package contents on your system after download and start the WordPress Portable executable afterwards. The blog is available from that moment on and you can do all the things that you can do on a self-hosted WordPress blog as well. Just open http://localhost/wordpress/ in your web browser to open the local WordPress installation. 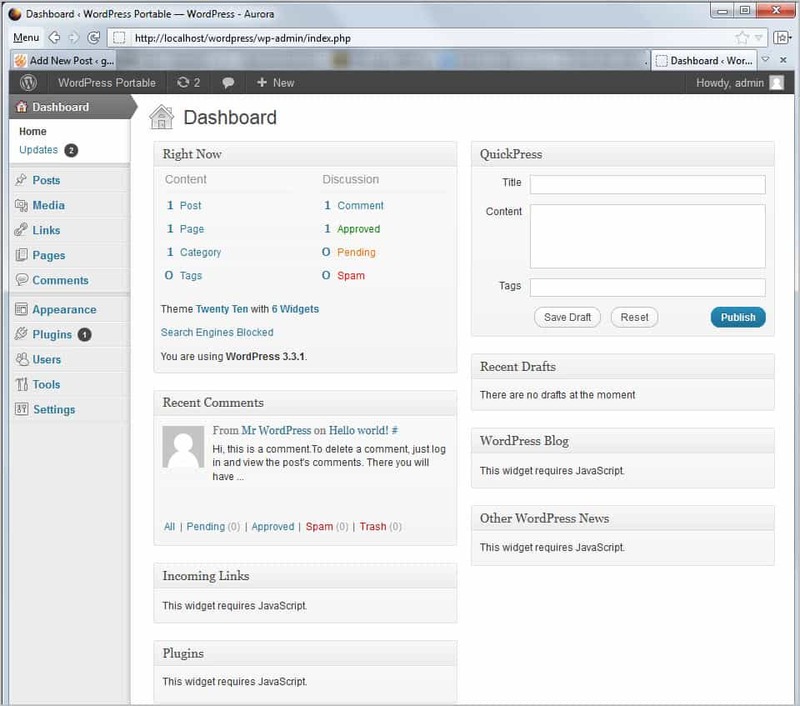 Click on log in and enter admin as the username and password to open the administrative interface of the blog. First thing you may want to do is to upgrade the blog to the latest version. You should see a notification at the top of the admin interface on first run. The update takes considerably longer than it would on a remotely hosted website. Once done you can start to install new themes and plugins, modify settings, and to start writing your first posts. You basically can do everything that you can do on a self-hosted WordPress installation. The local installation can be used for several purposes. This includes local theme and plugin development and testing, testing new WordPress versions before you upgrade your live blogs on the Internet, or to showcase blogs to clients or friends. Another option is to use the local WordPress blog to store your own personal writings, a diary for instance or important information that you need to write down or want to collect. WordPress Portable ships with Apache, PHP and MySQL included, which means that you do not have to install those technologies prior to installing the blog. New users benefit from the simplicity of the solution, while advanced users may like the ability to put the package on a portable drive or stick, or to use it to quickly run tests locally. The project lacks documentation which can be a issue for some users. It is for instance not clear if and how Apache, MySQL and PHP can be updated to newer versions, or if it is possible to import the database of an existing blog (the later may be possible with the help of plugins). 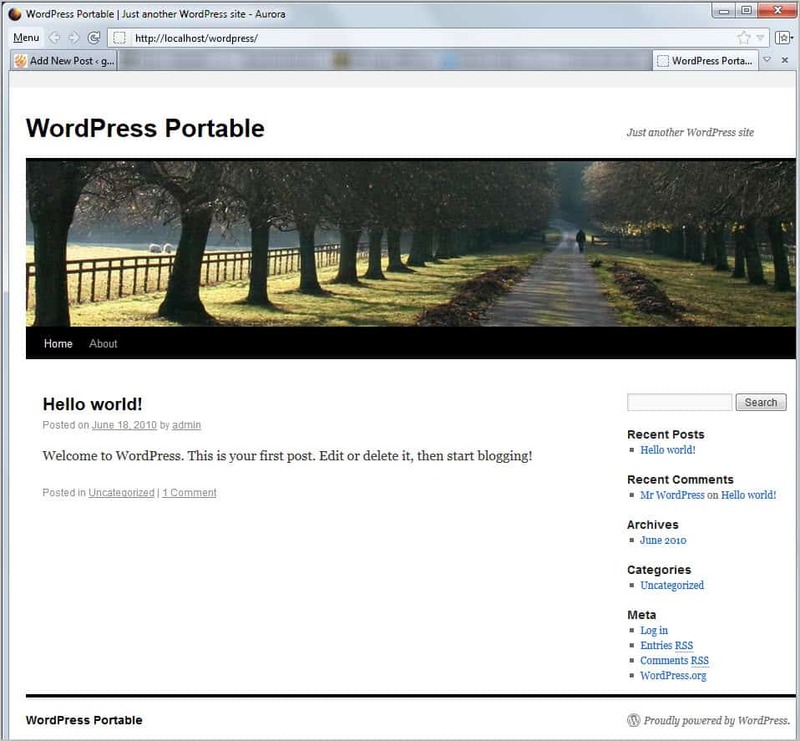 WordPress Portable is only available for the Microsoft Windows operating system. Interested users can download the latest version of the package, weighting in at about 10 Megabytes, from the developer website. Personally, I would look at WordPress Bitnami stack (They got it for windows as well). Bitnami stack is very useful for cloud installs (for example, in GoGrid or Amazon Cloud) or when one wants to install software that requires lots of dependencies. While I install WordPress myself, I have chosen to use Bitnami distribution for one Ruby on Rails website (Redmine) as there were lots of dependancies to fix. Making multiple sites is easier with DesktopServer and each of your projects can have its own domain name instead of ‘localhost’. Plus, it’s optimized for WordPress. Just a few clicks and you can create or remove sites AND COPY entire sites. Really nice if you ‘screw things up’ and want to start over or just accelerate your projects with templates. Hey Martin, I have a question. What add-on did you use to create a text only ‘Menu’ that replace standard graphic Firefox Menu at the upper left? This is great guide for a local installation of wordpress, our team is always testing the plugins and themes we develop on a local wordpress blog before we release it to the public. I wanted to inform your readers about our free online wordpress installer, using it they can install a self hosted wordpress blog in less than 3 minutes. Our Online WordPress Installation tool is free to use, no strings attached, you can start using it instantly. If you have any questions feel free to reply here and I will get back to you with a reply. I know no-sql may be what everyone is headed towards, but at the moment, anyone try the portable sql-based, portable web servers… like XAMPP or MoWes? I’m especially interested in hosting a website locally that uses curl! I used XAMPP back in the days, and it offered a better functionality than Portable WordPress. You had access to phpMyAdmin for instance, and I mainly used it for local script testing, especially WordPress related. This portable WordPress could be really useful for save backups . It never hurts to have one more. This is super cool. I know WordPress and hosting, but I never took the dive to doing a local WordPress install for testing my hand at doing my own blog design. With this I can just go for it! On a similar note,, Before I go too far into this piece and tell you why anyone would want to clone a WordPress blog, I am going to tell you straight up. I am a blogger, and I love to blog. However, on the side, I am also an affiliate marketer, and this is really where this sneaky little trick comes in handy. It is in my organization perception that learning how to clone a WordPress blog is a particular of the most principal techniques that you can have in your arsenal, specially if your venture, like quite a few other The web Marketers, revolves about the strategy of setting up a major community of ınternet sites, and successfully monetizing them. Developing the capacity of deploying a new internet site inside of a make a difference of minutes is a person of the most remarkably valued knowledge that you can have as an Net Marketer, and can at moments absolutely help you get some competitive edge when it comes to choosing established up as quickly as feasible.